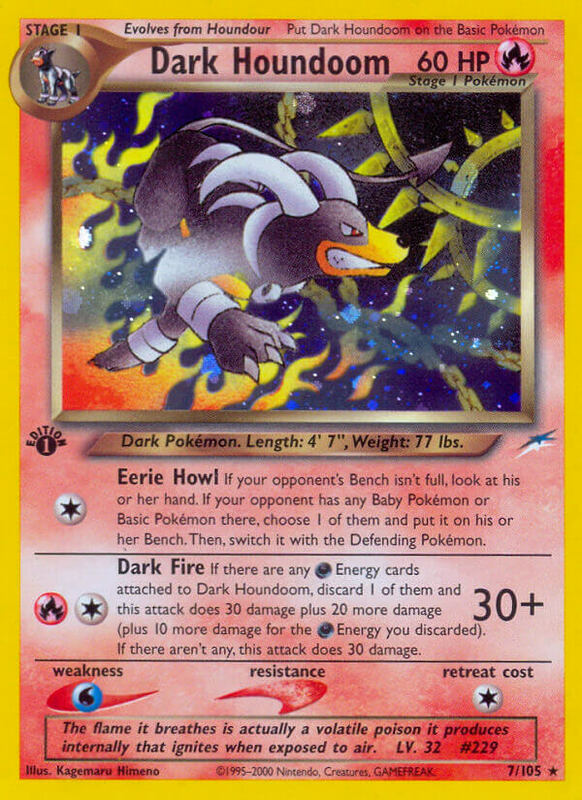 If there are any Energy cards attached to Dark Houndoom, discard 1 of them and this attack does 30 damage plus 20 more damage (plus 10 more damage for the Energy you discarded). If there aren’t any, this attack does 30 damage. Would this deal 60 damage using a basic Darkness Energy due to the card’s wording? I’m guessing they only took Special Darkness energies into account here, so I’m guessing probably not. I know this is old, but yes, since basic Darkness Energy has the same symbol as the old Special Dark, it would do 60 damage as opposed to 50. Psykicked, don’t be so certain. Go look up some official rulings from the older versions of the Rulings Compendium at http://compendium.pokegym.net/ to see how things were ruled in the past. Some have since been overturned but seeing those led me to look up the original Japanese version of this Dark Houndoom. I do NOT read Japanese, but there’s no “+10” in there. Put it all together, and I think WotC added “reminder” text for how the cards worked but did a poor job of it. The +10 for the Energy being discarded was because you were supposed to still get any bonus provided from the Special Energy version of the Darkness Energy card. Which is why past rulings clarified something like Rainbow Energy does NOT grant +10 BUT something like R Energy (which added +20) provides +20. First Fire Type Houndoom card!